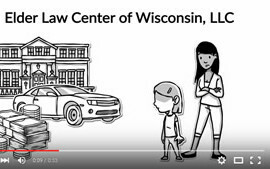 How does anyone know if they need estate planning or estate planning attorney in Wisconsin? It’s simple, every adult needs estate planning. The question is what kind? Everyone’s estate, family situation and goals are unique. Therefore, there is no cookie cutter approach that is appropriate. There are a number of tools that can be used and customized to fit your particular situation. These tools can include Wills, Marital Property Agreements with Washington Will Provisions, Financial and Medical Powers of Attorney, Revocable Living Trust, Asset Protection Trust, Life Insurance Trust, Charitable Trust, Trusts to protect beneficiaries from divorces and lawsuits, and many other legal “tools”. The first step is to sit down for a complementary consultation to discuss your particular goals, situations and then be educated as to the various options you have to accomplish and ensure that your goals are met. Estate planning is not about how much money you have, it’s about protecting what you have during your life and for those you love after you are gone. It ensures what you have is received by the people you love, when you want, and the way you want. Most confusion in estate planning comes from not knowing where to get good information on options. Many people tell us that they have already done it with their financial advisor, banker, or CPA. There are two aspects to estate planning, legal and financial. Financial advisors, bankers, CPAs, and other financial professionals can assist you with the management and growth of your assets and avoidance of taxes, but they cannot assist you with the legal work necessary for estate planning. Proper legal estate planning ensures the necessary legal documents are in place to keep you in control of your assets as long as you are able and when you are not, to put people you trust in control with sufficient instructions to guide them on how to use those assets for your benefit or the benefits of the people you love. In addition, a proper estate plan will not only identify who’s in control and who benefits, but when. Upon your disability you will want to ensure your loved ones are provided for and your needs are met as well. Upon your death you’ll be able to again identify who gets the benefits and who gets to control those assets. After your death it is much more cumbersome because other parties, i.e. new spouses or creditors etc. can attempt to go after your money. There are also various taxing strategies that can be included in your legal estate plan to minimize or avoid taxes. Only a lawyer can do this! You can even provide instructions for your children to inherit in a manner with full use and access without being accessible to their spouses in divorce, nursing homes, lawsuits, or other outside sources. So whether you have $40,000.00 or $400,000.00, you have worked hard for it. Legal estate planning will ensure it is there for you until you no longer need it and to make sure it gets to those you love when you are done with it. What is asset protection? Basically, asset protection ensures the assets you build over your lifetime are not susceptible to being lost to the government, nursing homes, lawsuits, divorce, bankruptcy, or other outside sources. Asset protection is broken down into two key considerations; protection while you are alive and protection after your death. If protection during life is sought, the question is whether you want to protect from creditors and predators or nursing homes, or alternatively protect from taxes at your death. There are strict rules on how to protect your assets during life or after death, but they are easy to accomplish when done properly. Planning for tax protection is very different from planning to protect from other creditors. There are a variety of asset protection trusts available but they all work very differently. Some allow individuals to retain control of their assets, and even use or benefit from them, without subjecting them to your creditors and other outside sources. Others, however, prohibit the owner from controlling or benefiting from the assets. Some asset protection permits the individuals creating the trust to change and modify the trust during their lifetime and utilize the trust assets for family members and other intended beneficiaries, but others prohibit any such changes. The estate planning laws change regularly. A careful balance between protection during life and after death and protection from taxes or from other creditors or nursing home is critical. Asset protection planning is not what it used to be. There are many new opportunities that did not exist even ten years ago. 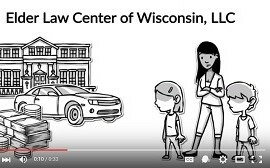 Call Elder Law Center of Wisconsin, LLC to discover all the ways you can protect what you’ve worked a lifetime to accumulate. Charitable giving techniques are typically used for those who have accumulated wealth that is subject to estate tax at death. Those who have worked hard to create and accumulate assets often opt to utilize charitable giving techniques to minimize taxation while creating a lasting legacy without necessarily depriving family from benefitting from your assets. Charitable planning is also utilized to minimize income taxes (which can exceed 40%), and you can retain full control of your assets. Charitable planning can also be effective when selling your business. When properly utilized, you can avoid paying income taxes on the sale of your business when sold. Utilizing a charitable giving plan enables the donor to direct the use of his or her assets that would otherwise go to the IRS. Your assets can pass to your family, charities, or the IRS, but you must choose two out of the three. If you don’t, the IRS wins by default. At death, the remainder goes to the charity of your choice. Help! I am in Crisis and need assistance now! Fill out the form below & an Elder Law Center Team Member will be in contact with you soon! Have a Question? Need Immediate Assistance?